Today we are proud and excited to announce the Cherry Framework 5 release! We have redefined all our solutions and have created a new conception of framework. Read along, we will be more than happy to show you all the new features and key benefits of our beloved Cherry 5! What’s under the hood of our new Cherry 5? Just making it clear: we work with WordPress a lot here and we believe that we know exactly what functionalities and features WP users want to see and use. Our approach hasn’t changed: We do not release something just for releasing it. We do it only when we are completely sure that we can give you something new and offer you new amazing features you could use in your projects. Save your time with 15 widely-used design elements including UI Select, UI Button, UI Textarea, etc. We also include additional elements, such as UI Repeater, UI Color Picker, UI Icon Picker, UI Image Uploader, and more. Using the version control, you can extend the core of the framework with your own modules. Experiment, and adjust Cherry 5 to your needs. Have you ever had these situations when you had to build the same blocks of code over and over again? Forget about it and try out our new collection of the most frequently used utilities out-of-the-box! Master the WordPress Customizer with our Cherry Customizer module. Simply initiate the module and pass an array of options grouped by sections and panels. Now adding theme settings is easy. The Cherry Framework is a great tool for not only themes but plugins as well. The pre-built modules will help to quick start your plugin or theme easily. What is so special about Cherry Framework? We all know how important is it to have a tool that will help to build a website from the scratch in a short term. What’s more important, this tool should be well-documented and to be easy in use. And if you are looking for such tool, then guess what? We are here to tell you about one! There are plenty of reasons why you should choose Cherry, but we made it easier for you and highlighted the key benefits of our framework. Cherry Framework is free and available for anyone who’d like to use it for their themes or plugins. The source code is available on GitHub and each of you is free to contribute to it. A thorough documentation is important for every web project and Cherry is not an exception. Each module of the framework is well documented so that you can find exact instructions on how to use it in your themes or plugins. Cherry Framework has a version control, which means you can use it simultaneously with different plugins or themes. This enables you to keep your framework always up-to-date with the latest version easily. If you’re comfortable with customizing simple WordPress themes, you’ll get a grasp of Cherry very quickly. 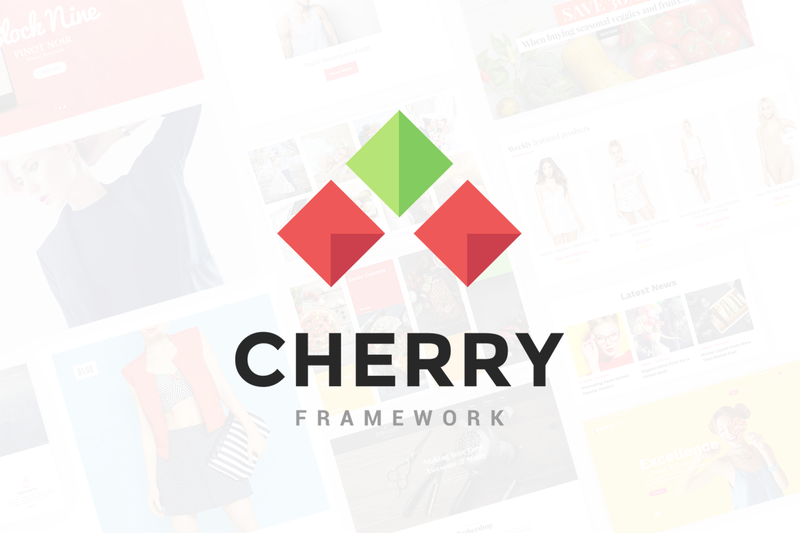 Cherry Framework is a solid foundation for building WordPress themes and plugins. Once getting accustomed to building sites with Cherry, you can finish your projects in no time. Use our collection of free Cherry plugins in order to add popular features into your themes. Most of the plugins don’t have equals in the free plugin segment. Combining all this *thing* Cherry can become one of your favorite WordPress development tool. Try it yourself, if you don’t believe us! New version of our framework is compatible with all popular WordPress plugins, however, we also have a collection of plugins developed and optimized for Cherry specifically. They enrich the functionality of Cherry themes and make them easy to work with. You can download all these plugins for free by the links listed below or on the main page of our website. Start improving your project with the help of these plugins today! Cherry Projects is a portfolio management system that lets you create your projects and display them using a large number of options. Cherry Real Estate is completely free, yet powerful enough plugin to turn your WordPress website into a full-featured real estate portal with extensive functionality. Cherry Sidebars is a lightweight plugin for creating multiple widget areas, and outputting them on posts or pages of your choosing. Now you don’t have to limit yourself to one widget area, instead, you can create as many as you like. Group your widgets into multiple areas, and pick which one you want to display for a certain post or page. When your company offers a variety of services it is very important how those are presented to your customers. Cherry Services is a flexible WordPress plugin that lets you display your company’s services in a beautifully formatted way. Introducing the team that stands behind your product to your customers is a crucial part of your relationships with them. It is very important to display your team members list in the most informative and stylish way and trust us, there is no easier and better solution for this purpose than our Cherry Team Members plugin. Cherry PopUps is a powerful and extremely useful plugin, which allows you to create customizable pop-up windows and manage them effectively. With this plugin, you will be able to add advanced search functionality to your WordPress website. Unveil customers’ feedback on your services to look more reliable to prospects. This easy-to-use plugin will let you add testimonials to any post and page of your site via shortcodes. I wander where is the information how to install it???????????????? “Easy for beginners” ! How the beginner can use it if there is no docomentation! Can I upgrade from cherryframework 4 to framework 5? If so where can I download it (Cherry Framework 5)? Cherryframework 4 is not possible to safe-update to Cherry5, there is no backward compatibility. The version 5 – https://github.com/CherryFramework/cherry-framework. Maybe, if your site has created on Cherry4 it would be better to stay on this framework version.